You’d have had to have been in Ulaanbaatar, Mongolia the last year or so to have missed the run up of microfinance. Between 2004 and 2006 more than $4 billion of capital flowed into microfinance institutions. All told experts say the total loan microfinance loan portfolio may be as much as $12.5 billion. And of course the father of microfinance, Muhammad Yunus won the 2006 Nobel Peace Prize. Microfinance is now so respectable, so effective, (so profitable!) that it’s already enjoying its first global backlash. Actually that first sentence is hyperbole. Because even in Ulaanbaatar… far from almost anywhere on the vast, frigid steppes of Mongolia… microfinance is thriving such that the earliest recipients of micro loans there are now complaining about taxes and government bureaucracy! And May 29-31, 2008 the Conference of Microfinance Institutions will convene in Ulaanbaatar, the eleventh such annual conference. Now Advanta, a credit card issuer to small businesses in the U.S. and Kiva, a nonprofit charity and the cool kid of microfinance, have joined hands to offer an interesting cause-related marketing campaign and a damn cute website. When a business makes a donation to Kiva using its Advanta credit card, Advanta will match that donation up to $200 a month. The campaign also serves to promote the Kiva affinity credit card. I couldn’t find anything that said if the promotion had a predetermined end date or if there was some other kind of cap on Advanta’s matching dollars. Also, because of billing cycles and such, the Advanta matching money isn’t likely to go to the same Developing World entrepreneur as the cardholder’s donation. As an old telethon writer, I can promise you that matching donations work like crazy on the hoi polloi. Every time we ran a corporate match the phones would explode in 200 U.S. and Canadian markets. No doubt major donor fundraisers would testify of the same effect with the well-heeled. People in all classes give more readily when they know their donations will be matched. The KivaB4B website is wonderfully egalitarian, useful and elegant in a Spartan way. The pages are divided vertically, with each entity getting half. When you click on a link, the link on the other side also lights up and both halves of the page display the information from their perspective. I like it. It’s inventive and the execution is terrific. And the cause of ending poverty in the Developing World is increasingly resonant among the populace in the Developed World. The harping critics be damned; microenterprise isn't perfect, but it works. I especially like the way the KivaB4B site draws equivalency between small businesses the world over. I’m a little surprised that Advanta didn’t add an extra piece to incentivize small business owners to adopt the Kiva card. I don’t know what Advanta’s new customer acquisition cost is, but a one-time donation of $25-$50 to Kiva for each new card signup seems like an appropriate number. Finally, there’s no mention made of it anywhere in the materials, but the Kiva branded credit card probably generates a donation to Kiva itself to underwrite their operating expenses. Nothing wrong with that. 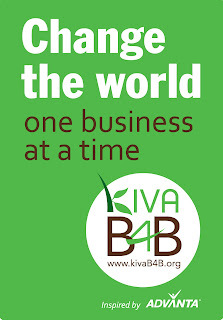 Kiva has a very small staff and relies heavily on volunteers the world over. It’s a wonderfully efficient charity. But it still has expenses. I hope other credit card issuers are taking note of this promotion. It looks like there's a cap of $200 per month per account. Still, that adds up pretty fast. I think I might actually be persuaded to get one of those cards. Hi. I think your blog is very interesting. The thing is that I have been looking for a good bank and decided to check out the customers’ reports in the Net. I should say that comparatively not many complaints and negative feedbacks are filed against Advanta. I went to this great site www.pissedconsumer.com and also found very few of them.